Twenty percent of children between the ages of 13 and 18 live with a mental health disorder. Suicide is the 3rd leading cause of death in youth ages 10-24. Boys (& girls) are feeling the weight of anxiety, depression, ADHD, autism and mood disorders. And for every affected child, there is typically at least one parent who is trying desperately to help their child. It’s not easy. Stigma still makes it hard to discuss mental health openly, and a lack of psychiatric care providers, coupled with logistical and financial barriers to service, make it difficult for parents to find the help they need. Perhaps that’s one reason why the average delay between the onset symptoms and intervention is 10 years. 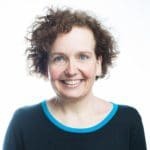 Author Ann Douglas intimately understands the pain, challenges, obstacles and confusion of parenting a child with problems. All four of her children were diagnosed with one or more psychiatric disorders and/or learning disabilities — and all four are thriving today. 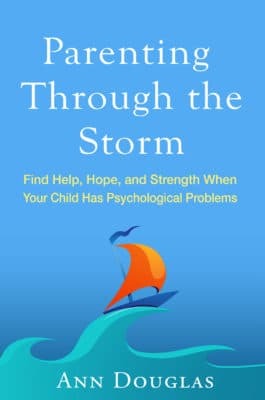 Her book, Parenting Through the Storm: Find Help, Hope, and Strength When Your Child Has Psychological Problems, is the book she wishes had existed when her children were struggling. It’s her attempt to spare other families some of the pain she and her family experienced as they searched for answers. We recently asked Douglas about red-flag behaviors in boys, and how to best help boys (including boys who resist help). Boys and girls sometimes exhibit different symptoms of psychological problems. What are some commonly seen – and commonly missed – symptoms in boys? While there are exceptions to every rule, in general, the research shows that boys tend to “act out” (engaging in aggressive or delinquent behavior) while girls tend to “act in” (becoming withdrawn or engaging in self-injurious behaviors). Of course, this has to do with the fact that boys and girls are still socialized in different ways and, as a result, are still taught to handle problems and challenges in different ways—this despite our best efforts to inch toward more gender-neutral ways of raising children. So a boy who responds to frustration by punching a hole in the drywall or bullying his younger sibling could be exhibiting signs of depression or struggling with some other type of difficulty (perhaps ADHD, which is characterized by difficulty in regulating emotions). It’s important to consider all the possibilities here as opposed to simply writing off his behavior as a case of “boys being boys.” That means asking yourself if what you’ve witnessed is an isolated instance of frustration or whether it is actually part of a consistent pattern—and what this might mean for your son. For all kinds of cultural reasons, boys & men are often less likely to seek help or admit a problem. How can a parent who suspects a problem best help and support a boy who denies a problem? Who refuses evaluation, counseling or treatment? You may find yourself taking a two-tiered approach here: trying to do whatever you can as a parent to try to make things better for your son while simultaneously continuing to encourage him to seek out help from a doctor, therapist, or other trusted person (a sports coach, a teacher, or a much-loved grandparent, for example). The good news is that there are a lot of things you can do to make the situation better in the meantime (while you are waiting for diagnosis and treatment): using parenting strategies that invite collaboration and that bring out the best (as opposed to the worst) in your son; becoming a strong advocate for your child, working on your own coping and stress management skills (and teaching these skills to your son), and encouraging yourself and your son to make a healthy lifestyle a priority. You will probably find that your son is more likely to be willing to go for an evaluation if he knows of other peers who have benefitted from diagnosis and treatment. Knowing how much better a friend is functioning and feeling as a result of having taken this step will encourage him to want to take this crucial first step himself. It will also help to reduce the stigma associated with asking for help—a powerful deterrent for many boys and young men. And, speaking of stigma, it’s important to tackle it head on: to let your son know that it’s possible to have a diagnosis and a great life. He doesn’t have to choose one or the other. He needs to know that a diagnosis is just a piece of information about him. That diagnosis doesn’t even begin to define him and it doesn’t have to limit him—and it could very well make life a whole lot easier. National crisis support referral number: 1-800-273-TALK. National crisis text support invention: Text the word START to 741-741 (you don’t get charged the texting fees and it will not show up on a bill). There are still lots of misconceptions regarding mental health, and parents often have differing ideas regarding how to best handle challenges with their children. Some parents are very open to the idea of psychological evaluation and treatment; others “don’t believe in” that “stuff.” How can parents best help their child if they’re not on the same page? Find a way to get on the same page. It’s that simple. Commit to family counseling or some other process, like taking parenting classes together, that will help you find this common ground with your child’s other parent. There’s too much at stake to decide not to go this route. Sure, it can be time-consuming and uncomfortable, to say nothing of expensive, to commit to individual, couples, and/or family therapy, but the upside can be huge for your son. It might even be life saving. How can parents take care of themselves in the midst of all this stress? Why is self-care so important during this time? Sometimes parents feel like they’re being selfish by taking good care of themselves while their child is struggling. It’s so important to understand that self care isn’t selfish: it’s self-preservation. And no one needs a happy and healthy parent more than a child who is struggling. Taking good care of yourself is one of the kindest things you can do for your child. So make sure you’re getting enough sleep, eating well, and making time for physical activity and fun. Remind yourself that you deserve to have joy in your life right now. What words of wisdom and encouragement do you have for parents who are worried about their sons – sons who have yet to be diagnosed, who haven’t yet found effective treatment or haven’t even admitted a problem? Don’t underestimate how important you are to your son—even if he keeps trying to push you away. You have the opportunity to be a calming presence and a guiding force in his life (although I know that can feel like a tall order some days, when your own emotions are completely in turmoil). I used to feel like there was some sort of mental health fairy godmother who would show up at my house and make things better for my kids. A conversation with a kind-hearted police officer shifted my thinking on that issue. He made me realize that I was my kids’ best hope. It was both a terrifying and liberating realization—that so much rested on my shoulders. And, in the end, we came through this difficult time stronger and more connected than ever. Kids are resilient. Families are resilient. We can weather the storm together. Ann Douglas is the creator of The Mother of All Books ® series (The Mother of All Pregnancy Books, The Mother of All Baby Books, The Mother of All Toddler Books, and The Mother of All Parenting Books) and the author of Parenting Through the Storm: Find Help, Hope, and Strength When Your Child Has Psychological Problems. Visit www.anndouglas.net to learn more about her and her work.